Hello beauties, I hope you've had a lovely weekend, doesn't time go by so fast? Anyway a few weeks ago I was so stunned to find out that I'd one a blog giveaway that was hosted by a lovely girl called Sammy from 'Blinkered Barbie'. I have to give her a huge thank you for that, it's the first thing I've won in my life! These lovely Maybelline 24hr Color Tattoos were amongst many other products that I won in the giveaway and I couldn't resist trying them out the moment I got them through the post. They have been so highly recommended in the blogging community this year. There have been so many fantastic reviews from bloggers about these shadows by Maybelline and they were even compared to the MAC paint pots so you can imagine how excited I was to try them out. 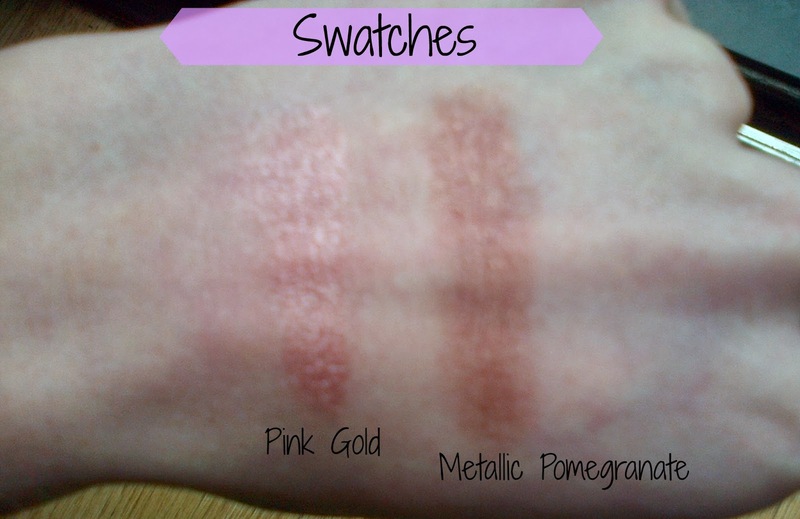 The shades I got were 'Pink Gold' and 'Metallic Pomegranate'. Pink Gold' is a lovely pink shade with little flecks of gold which reflects so beautifully in the light and 'Metallic Pomegranate' is a Burgundy/Cranberry shade with a mix of gold and silver flecks which works perfectly with my green eyes this season. I have to admit these are the very first cream shadows I have tried as I was pretty worried that they would crease but they didn't. The Color Tattoos are a mix of gel-cream shadows and they come in a handy sturdy glass pot. They look quite solid in the pot but once you swatch it, it melts onto your finger and it feels so creamy. I can't comment on the 24hr lasting power as I don't see a time where I would need to wear the shadows for that period of time but however they lasted quite well for 9 hours when I was on my work experience. The very first time I used the shadows I was amazed at how well they applied onto my lids, they glided on beautifully. You can forget about using a brush for application, you can use your fingers to apply the shadows instead. The thing I love about these shadows is that you can do your eye makeup in at least 2-3 minutes. As for the pigmentation, it's brilliant and the shade 'Metallic Pomegranate' is quite deep and a little intense that it doesn't need to be built up. As for the shade 'Pink Gold' it is quite a pale pink so you need to build it up a little for the color to show. For a normal quick daytime look I use my fingers to apply the 'Pink Gold' shade as a base color and 'Metallic Pomegranate' on the outer corners and apply liquid liner on my top lash line. Overall I am so impressed with this product and I really want to try the shade 'On and On Bronze'. I highly recommend this product to anyone! You can buy the Maybelline 24hr Color Tattoos for just £4.99 from Boots or Superdrug and come in various other shades. 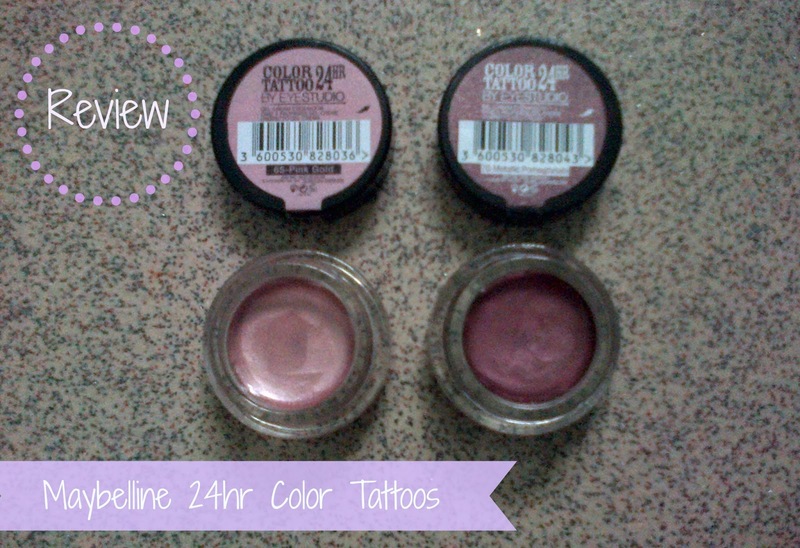 Have you tried the Maybelline 24hr Color Tatoos?